A co-founder of worldwide advertising agency BBDO, Osborn went on to author several theories of creativity, culminating in the creation the Creative Education Foundation. But his foray into pedagogy began back in 1921 with A Short Course in Advertising, his first book in which he explored the principles of the advertising business. Yet it wasn’t until 1942 with the publishing of How to Think Up that the so-called “father of brainstorming” established himself as a foremost philosopher in applied creativity. Later books included Wake Up Your Mind: 101 Ways to Develop Creativeness (1952), Your Creative Power: How to Use Imagination (1952), Applied Imagination (1953), and How to Become More Creative (1964). He found that when these rules were followed, a lot more ideas were created and that a greater quantity of original ideas gave rise to a greater quantity of useful ideas. Quantity produced quality (when judgement is suspended). Using these new rules, people's natural inhibitions were reduced, inhibitions which prevented them putting forward ideas which they felt might be considered "wrong" or "stupid". Osborn also found that generating "silly" ideas could spark off very useful ideas because they changed the way people thought. Arrange the meeting for a group of the right size and makeup (typically four to eight people). Write the initial topic on a newsprint/flipchart, whiteboard or other system where everyone can see it. The better defined, and more clearly stated the problem, the better the session tends to be. Make sure that everyone understands the problem or issue. Review the ground rules. Avoid criticizing ideas and suspend judgement. All ideas are as valid as each other. A large number of ideas is the aim, if you limit the number of ideas people will start to judge the ideas and only put in their “best” or often, the least radical and new. Don’t censor any ideas, keep the meeting flow going. Listen to other ideas, and try to piggy back on them to other ideas. Avoid any discussion of ideas or questions, as these stop the flow of ideas. Have someone facilitating to enforce the rules and write down all the ideas as they occur (the scribe can be a second person) Generate ideas, either in an unstructured way (anyone can say an idea at any time) or structure (going around the table, allowing people to pass if they have no new ideas). Clarify and conclude the session. Ideas that are identical can be combined, all others should be kept. It is useful to get a consensus of which ideas should be looked at further or what the next action and timescale is. Facilitation: How to turn it on? To run a group brainstorming session effectively, follow these steps. How much information or preparation does your team need to brainstorm solutions to your problem? Remember that prep is important, but too much can limit – or even destroy – the freewheeling nature of a brainstorming session. Consider who will attend the meeting. A room full of like-minded people won't generate as many creative ideas as a diverse group, so try to include people from a wide range of disciplines, and include people who have a variety of different thinking styles. When everyone is gathered, appoint one person to record the ideas that come from the session. This person shouldn't necessarily be the team manager – it's hard to record and contribute at the same time. Post notes where everyone can see them, such as on flip charts or whiteboards; or use a computer with a data projector. If people aren't used to working together, consider using an appropriate warm-up exercise, or an icebreaker. Clearly define the problem that you want to solve, and lay out any criteria that you must meet. Make it clear that that the meeting's objective is to generate as many ideas as possible. Once everyone has shared their ideas, start a group discussion to develop other people's ideas, and use them to create new ideas. Building on others' ideas is one of the most valuable aspects of group brainstorming. Although you're guiding the discussion, remember to let everyone have fun while brainstorming. Welcome creativity, and encourage your team to come up with as many ideas as possible, regardless of whether they're practical or impractical. Don't follow one train of thought for too long. Make sure that you generate a good number of different ideas, and explore individual ideas in detail. If a team member needs to "tune out" to explore an idea alone, allow them the freedom to do this. After your individual or group brainstorming session, you'll have a lot of ideas. Although it might seem hard to sort through these ideas to find the best ones, analyzing these ideas is an important next step, and you can use several tools to do this. Use Affinity Diagrams to organize ideas and find common themes1. It was believed that by stimulating different ways of looking at the problems, new ways of thinking could be developed. Hence, it was suggested the teams work through the Osborn Checklist. The original list to access the creativity is below. It has been reduced in one form by the SCAMPER questions and by other groups to six critical components by some advocates as shown in the diagram below. Can we Put to other uses? As it is? If modified? Modify? Give it a new angle? Alter the color, sound, odor, meaning, motion, and shape? Substitute? Different ingredients used? Other material? Other processes? Another place? Other approach? Other tone of voice? Someone else? Reverse? Opposites? Backwards? Reverse roles? Change shoes? Turn tables? Turn other cheek? Transpose “+/-“? Substitute – Components, materials, people. Combine – Mix, combine with other assemblies or services, integrate. Adapt – Alter, change function, use part of another element. Modify – Increase or reduce in scale, change shape, modify attributes (e.g. color). Reverse – Turn inside out or upside down. Alex Osborn and his successor, Sidney Parnes, a bright and creative person who followed Osborn as President of CEF, invested nearly 40 years teaching creativity workshops and course and thinking about the creative process, together created the creative problem-solving model. Noteworthy is that every step involves finding, which means the suspension of preconceived ideas and judgements permeates each step. Otherwise, the discovery process will be short-circuited and the ultimate solution will not materialize. Furthermore, it is often presented as five steps, but a preliminary step can be added called mess-finding which involves locating a challenge or problem to which to apply the model. In other words, the first step is problem definition, which from my experience is why many processes fail. They do not ensure that they are solving the correct problem and then have breakdowns in the execution of stage six Acceptance (and Implementation) finding. The steps guide the creative process. They describe what to do at each immediate step to eventually produce one or more creative, workable solutions. A unique feature is that each step first involves a Divergent thinking phase in which one generates lots of ideas (facts, problem definitions, ideas, evaluation criteria, implementation strategies), and then a convergent phase in which only the most promising ideas are selected for further exploration. Many will recognize the diverge/converge process from the more recent Whole Scale Change methods associated with Bruce Gibb, Al Davenport, Chuck Tyson and Kathy Dannemiller at Dannemiller/Tyson Associates. The green arrows indicate the divergent process and the blue arrows indicate the convergent process. 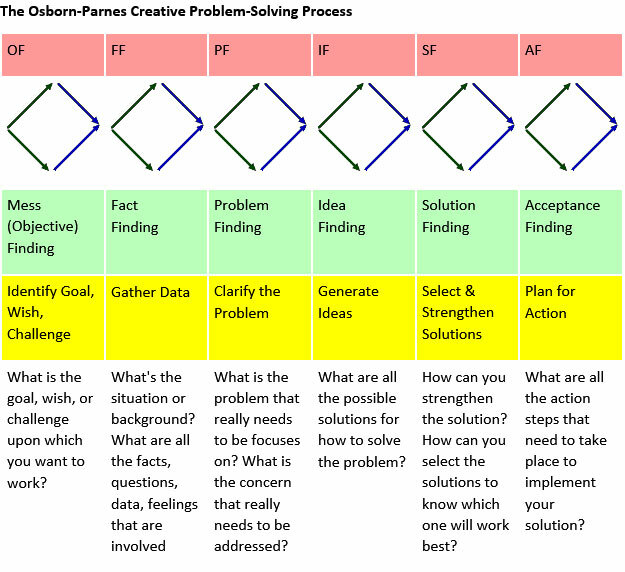 By creating specific “finding” focus for each of the six steps, the expansiveness of divergent thinking followed by the meaning-making and pattern recognition processes of convergent thinking leads to the indepth creative problem-solving process. In other words, each step of diverge/converge process is within divergence/convergence of the overall creative problem-solving process which leads to the emerging insights for the larger problem-solving. In creative work, there are two modes of thinking that we use that are very different but are both very useful for different parts of the brain storming process. Divergence is the process of thinking broadly, of expanding one's mind, of going places where one does not normally go. In fact, it is very much what most people think about when they consider creativity. This approach requires skills of selection, evaluation and judgement to whittle down the list to the most useful ideas. In this process, there can be argument and debate about the true potential of ideas. As indicated elsewhere, placing common ideas into themes or patterns of commonality can support this process. Divergent and convergent activities do not go well together, and keeping them deliberately separate is a very good idea as indicated in the above diagrams. Thus, you can explain the principles to people you will then be able to use the language, saying 'excuse me, I hear convergence' if someone starts criticizing ideas in the middle of a divergent session. Likewise, in convergent sessions, further divergence needs to be carefully managed. It is, however, more important to keep convergence out of divergent activities, as people easily take criticism of one of their ideas personally and may just clam up and sit back if they feel this has happened. Separation can be achieved in several ways. You can separate the sessions by having one after the other (this is most common). You can also separate them further in time (e.g. to give space for more ideas to be generated by incubation first). You can have different groups of people diverging and converging. You can change location for each - for example having the divergent session in a relaxed lounge and the convergent session in a formal meeting room. Divergence and convergence are not a one-shot thing in serious creativity and invention practices such as brain storming. They constantly sequence, one after the other and form a matched pair of activities that enable you to both think broadly and stay focused. As a brain storming process, you may diverge and converge in problem identification, idea exploration, product development, market planning, etc. For example, below the divergent/convergent process is divided into two divergent/convergent processes encompassing four stages: Discover, Define, Design, and Develop. Discover takes advantage of the divergence to collect all problem symptoms and facts, followed by the define the actual problem through the convergent process. Stage two, design, diverges to determine the potential ways to solve the problem, followed by develop, which converges to develop and execute the action plans toward problem resolution. What would you like to get out of life? What are your goals, as yet unfilled? What would you like to accomplish, to achieve? In what ways are you inefficient? What would you like to organize in a better way? What ideas would you like to get going? What relationship would you like to improve? What would you like to get others to do? What barriers or bottlenecks exist? What do you wish you had more money for? What makes you angry, tense or anxious? Fact Finding - Use Who, What, When, Where, Why and How questions to formulate the facts as can be known now. Who is or should be involved? What is or is not happening? When does this or should this happen? Where does or doesn’t this occur? Why does it or doesn’t it happen? How does it or doesn't it occur? Problem Finding - Listing alternative definitions of the problem. One principle of creative problem solving is that the definition of a problem will determine the nature of the solutions. Hence, making sure that the correct problem is being solved will address the challenge. In this step, it helps to begin each statement with "In what ways might we (or I) define ....". What do we really want to accomplish? Idea Finding - The divergent-thinking, brainstorming stage. This is where a variety of idea-generation ("creativity") techniques can be use. Ideas are freely proposed without criticism or evaluation, for each of the problem definitions accepted in the second stage. Criteria for evaluation must be listed to uncover assumptions and constraints that must be addressed. Are the materials and technology available? Will the public accept it? Will higher-level administrators accept it? Acceptance Finding - This step focuses on alignment, acceptance and how to get the ideas into action. This may involve creating an action plan, containing specific steps to be taken, by whom, and a timetable for taking them. However, it is also the beginning of future problems if time is not taken to ensure that what is developed in this step involves aligning around and accepting the actions that will be taken. 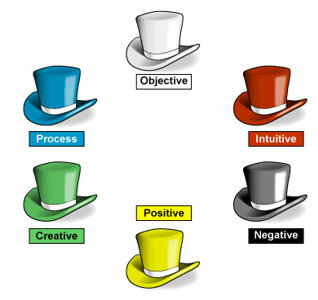 A variant during the six stages is the Six Thinking Hats created by Edward de Bono, and published in his 1985 book of the same name; subsequently revised in newer editions. The technique forces the team to move outside their habitual thinking style, and to look at things from many different perspectives. This allows them to get a more rounded view of the situation. The team can often reach a successful solution or outcome from a rational, positive viewpoint, but it can also pay to consider a problem from other angles. For example, the team can look at it from an emotional, intuitive, creative or risk management viewpoint. Not considering these perspectives could lead to underestimate people's resistance to the team’s plans, fail to make creative leaps, or ignore the need for essential contingency plans. Six Thinking Hats can be used in meetings or on your own. In meetings, it has the benefit of preventing any confrontation that may happen when people with different thinking styles discuss a problem, because every perspective is valid especially if used to support a brain storming session. Noteworthy is that six hats can be used in any single or all the stages collectively to get a 360-degree perspective. White Hat: with this thinking hat, the focus on the available data. Look at the information that you have, analyze past trends, and see what you can learn from it. Look for gaps in your knowledge, and try to either fill them or take account of them. Red Hat: "wearing" the Red Hat, look at problems using your intuition, gut reaction, and emotion. Also, think how others could react emotionally. Try to understand the responses of people who do not fully know your reasoning. Yellow Hat: this hat helps to think positively. It is the optimistic viewpoint that helps you to see all the benefits of the decision and the value in it. Yellow Hat thinking helps you to keep going when everything looks gloomy and difficult. Green Hat: Green Hat represents creativity. This is where you develop creative solutions to a problem. It is a freewheeling way of thinking, in which there is little criticism of ideas. The power of the brainstorming process is staying on course with the rules for setting the necessary container for creativity to emerge while using the guidelines to move through the process. Over the years, many brainstorming processes were not as successful due to not maintaining the container resulting in a frenzy of ideas and/or judgements. In addition, following the guidelines for deepening the process supports staying on target. For me, the divergent/convergent process Osborn and Parnes created for problem solving is highly energizing while remaining focused towards the ultimate solution. When used well, complex problems can be solved through an aligned understanding the situation and what needs to be done. When the six stages does not fit well with the tram, shifting to the Six Thinking Hats model can be applied through the diverge/converge method with great success. 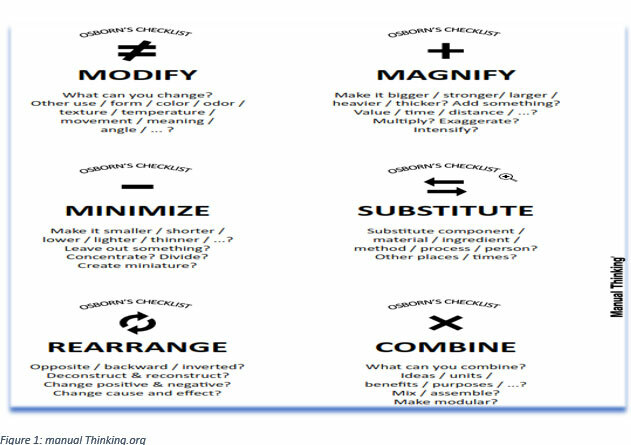 1 Japanese anthropologist Kawakita Jiro originally developed the affinity diagram – also known as the K-J Method or the affinity chart – in the 1960s.